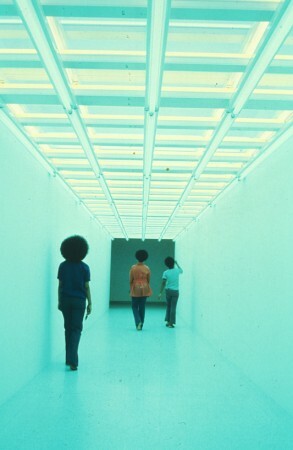 From the Archives: 1971 and "everything that is farthest out on the current art scene"
In 1971, Dan Flavin’s tunnel filled with multicolored lights, "Untitled (To Elizabeht and Richard Koshalek)," bisected a new Walker gallery designed to accommodate such works. In contemporary art, it’s not hard to summon nostalgia for the late ’60s and early ’70s, a time when so much of what artists were producing seemed authentically new and authentically cool (at least given today’s perceptions about “authentic,” “new,” or “cool”). The art world was smaller and more manageable in many ways, not least because the practice of discovering “alternative modernisms” had yet to be discovered. In New York, which was still regarded as its capital, artists were still colonizing the neglected downtown Manhattan lofts that would later become coveted real estate; more to the point, they were making art in these spaces that had no place in typical white-cube galleries and museums. 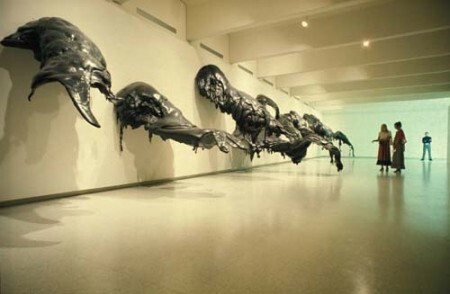 That’s what made the 1971 exhibition Works for New Spaces such a critical moment in the Walker’s history and, arguably, in the broader art world. 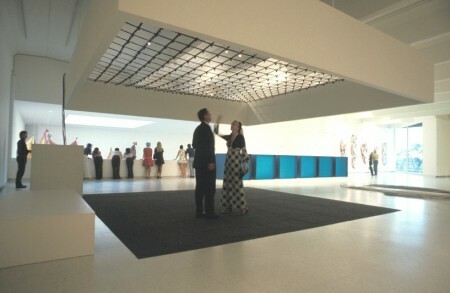 Curated by then-director Martin Friedman, the show inaugurated the Walker’s new building designed by Edward Larabee Barnes, whose seven white-cube galleries were, in fact, designed specifically with these new kinds of artworks in mind. As the title indicates, 21 of its 22 works were special commissions, with artists making the work partly or wholly on site. That practice is commonplace now, but this was the first time it had been done, at least on such a wide scale. 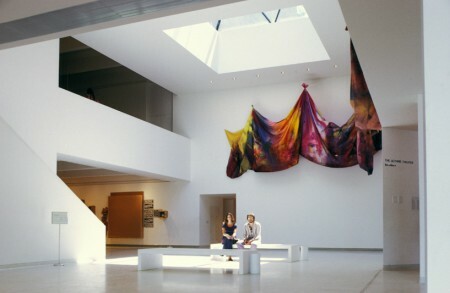 By 1971, Friedman had been leading the Walker for a decade, establishing his reputation as “a vigorous champion of everything that is farthest out on the current art scene,” as Hilton Kramer noted in the New York Times, reviewing both Works for New Spaces and the new Barnes building. But the commissioning of new art, which has become integral to the Walker’s mission, didn’t really get underway until the late 60s, while the Barnes building was under construction. Looking back 40 years from another era of “difficult times,” Friedman’s references to artists and the public on the attack, not to mention the destruction of artworks, are notable. Even if riots and bombings are still mostly taking place outside the U.S., there’s no question about the domestic factor in Time’s naming “the protester” as its “Person of the Year” with a cover story penned by Kurt Andersen. It’s also easier to see how 1971 and Works for New Spaces were not so much the advent of the ’70s but rather a culmination of the ’60s—a decade “of relentless and discombobulating avant-gardism, when everything looked and sounded perpetually new new new,” as Andersen observes in another piece in the current issue of Vanity Fair. Incidentally, his characterization of the ’60s in that article is part of a broader and fascinating complaint about how current culture seems stuck rewinding the past 20 years. Perhaps that phenomenon explains a craving for new-new-new alternatives to the same-old same-old—or maybe just a fondness for old art that was once bracingly new. 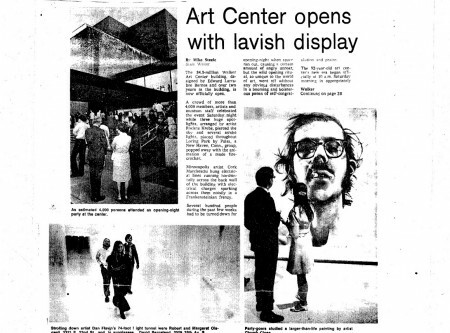 Above, Minneapolis Tribune coverage of the opening festivities for the new building and the show, which “has completely dominated the local art scene lately and continues to be a source of discussion and debate,” wrote critic Mike Steele in a later piece. 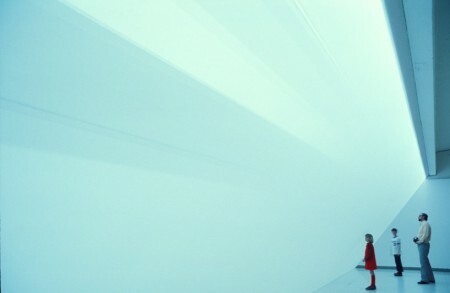 Created with “gauze-like fabric tautly stretched across a space,” Robert Irwin’s No Title was remounted in 2009, appropriately enough, in the Walker’s Friedman Gallery, part of the 2005 expansion to Barnes’ 1971 building. 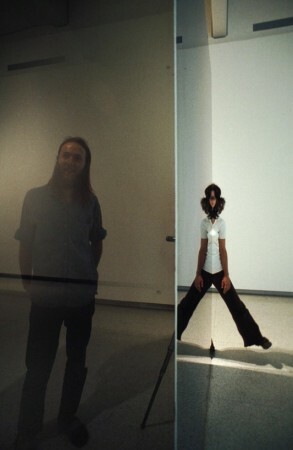 A blog post about the reinstallation shows some great archival images of Irwin and an assistant at work. 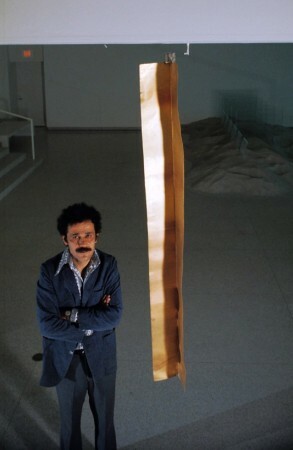 Larry Bell used “a huge vacuum chamber to adhere vaporous layers of a silver alloy on glass plates, which then assume an elusive reflectivity” in Garst’s Mind No. 2.